When it comes to garage/psych revivals, there’s more to investigate than just Fruits de Mer and Mega Dodo, which we’ve covered so much of. Up in Seattle, there’s Green Monkey Records, home of The Green Pajamas. 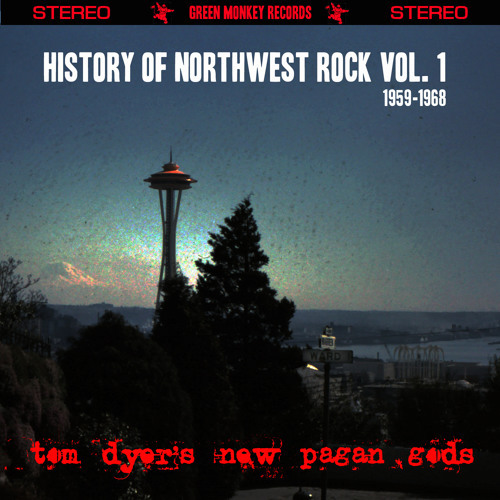 Seattle has a long history of music in this vein, going back to the 60s with The Sonics, The Ventures, Paul Revere and the Raiders, and a score of lesser known bands, and it is this rich history that provides the subject matter for Tom Dyer and his New Pagan Gods. Dyer is aided and abetted by members of King County Queens (guitarist Scott Sutherland and drummer Scott Vanderpool) and The Green Pajamas (bassist Joe Ross and Jeff Kelly on keyboards) – they could have been billed as The Green Monkey All-Stars rather than New Pagan Gods. The material includes some well known tunes (you probably shouldn’t try to do a Northwest rock history without including “Louie Louie”), some real obscurities (who outside of collector circles knows The Dynamics or The Dimensions or Tiny Tony and The Statics? ), and at least one unexpected recontextualized oddity (Merilee Rush’s “Angel of the Morning” with a male lead voice). The arrangements are approached with a spirit of invention rather than reverence – “Louie Louie” is almost unrecognizable, though according to the liner notes, it’s based on a little-known rendition by The Nomads, and “Angel of the Morning” is treated more like a rock song than the folky or countrified versions usually heard. In addition to being a great set of rocking tunes, this collection is something of a history lesson, and serves as proof that there’s more to Northwest rock than Jimi Hendrix and The Wailers. Here’s hoping there will be a Volume 2! As a footnote, when the band played this material at the release party, they added a killer take on “Purple Haze” which was not included on the CD due to licensing issues – a pity.